Not exciting, but here's the link for them. 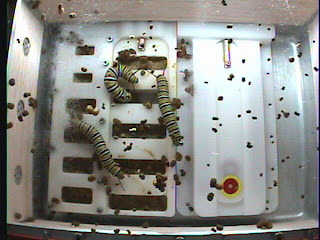 I'm fascinated by the prospect of their orbital pupation. Maybe because I want my own orbital pupation. I like the phrase "orbital pupation." Pupate with me, but orbitally. This past weekend I went to Indiana for my 10 year college reunion at the University of Evansville (which has the swankiest new union I've ever seen in my life--I got shafted!). 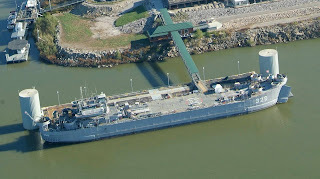 Besides catching up with several friends I'd not seen in at least eight years, I visited the LST-325 docked in Evansville on the Ohio River. And, like an idiot, I didn't bring my camera along, but go here for good ones. 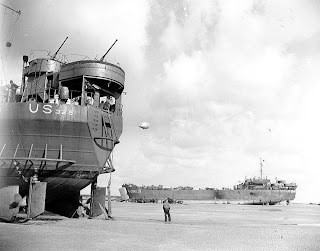 LST stands for "landing ship tank." 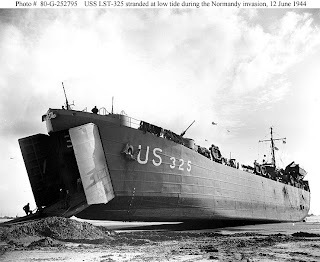 It's a 327 foot amphibious transport, having a draft of only 2' at the bow and 7' at the aft, with lots of 40mm and 20mm guns for defensive purposes (and bigger than you think--the 40mm took a two man crew just to aim and fire). At only 1,600 tons empty displacement, or 4,000 full, it ain't that large (I once visited the HMS Belfast in London, a light cruiser, and it was "small" at 10,000 tons). Still, the 325 was larger than I'd figured. There's irony. Stuck on France at low tide. Notice the blimps in the background, designed to discourage German planes from strafing allied ships. 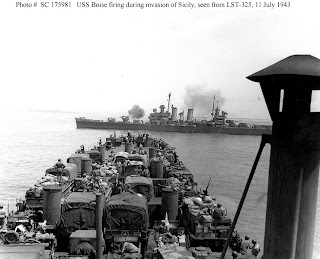 LST-325 was in the fray landing front line troops and tanks at Sicily and Salerno. It was part of the backup "B" landing at Omaha Beach in France, but even though it didn't see the intense fighting of the first landings, I was honored to stand on the deck of a ship that made the trip, and caried wounded and dead soldiers back to England. I've been to the beaches at Normandy twice before, and it was easy to let my imagination run wild. I made my wife go along on the tour, which was a fast 2 hours. I thought she'd hate it, but she kept asking questions of our super-informative Korean and Vietnam War vet tour guide--who graduated from UE on the GI bill decades ago. The 325 still houses vets who are restoring the ship, and has a working galley (spaghetti the day we toured), and a washer and dryer. Two dozen old vets brought the ship over from mothballs in Greece a decade ago, and 325 looks decent given its age. Hard to imagine 21 sherman tanks in the belly, and as many jeeps and artillery pieces and supplies on the deck. I can't imagine riding the 40 trips back and forth across the English channel during the war on a boat with a flat and high bottom--vomitous. Apparently, Evansville was the top builder of LSTs during WWII, making over 500. And of course, the labor force was largely women. 325 was built in Philadelphia in 1942. Our tour guide said that at first, it took the workers 1-2 months to build one ship, but by the end of the war they'd crank one out every week or two. Amazing. Today, the old vets take the boat on tours along the Ohio and Mississippi, and other rivers. What a life, a life I'm thankful we can freely live. Today on the Ohio River. "Sesame Street's 40th season aims to educate children about the wonders of the natural world and teach them about concepts such as habitats, hibernation, and migration. No matter where they live, "we want kids to know there's nature in their neighborhoods," Truglio said. In tomorrow's premiere episode, Michelle Obama—fresh from harvesting the White House's new organic garden in the heart of Washington, D.C.—will help Elmo and Big Bird plant vegetables in the ersatz inner city of Sesame Street." "Elmo and Abby decide to help Bert find this pigeon, and in their search they run into all these other kinds of birds. After kids watch this show, they'll be able to identify chickadees, blue jays, robins, and blue bar pigeons by their shape, size, and birdcall." "Global warming and deforestation—those are really adult concepts, and it's just too scary for children," said Rosemarie Truglio, vice president of research and education at Sesame Workshop, the New York City-based nonprofit that produces Sesame Street. "The place we're coming from is, 'Let's love and care for the Earth, because it's so beautiful, and we appreciate its awe and wonder, and we're going to respect it.'" Sesame Street's producers hope that children who learn to love and respect nature early on will grow up to become passionate advocates for our planet. "When you love something," Truglio said, "you want to take care of it." To see the full National Geographic article, allons-y. "The next Space Shuttle launch is scheduled for November 16th. continually capture images, which will be made available online." I have a habit of piling up mail order nursery boxes on my patio / deck. They might stay there for two months, protected from wind and rain. A few days ago, though, the last of my fall cleanup days was spurred on by 70 degrees and rare sunlight, so I went out to toss some trash and cut down the cardboard for recycling. Here is what I found. A female monarch, crisply dessicated. I'm not sure how a caterpiller found its way up the deck, up a chair, then around and into this box, because it was closed with another box stacked on top. The cat could apparently get in, but, of course, the butterfly could not get out. I wonder how long she struggled--being buried to death by her own drive to survive. And why did she have to be female? Tooth and claw I suppose, but I have a special affinity for monarchs. You can rest assured my boxes won't remained piled out there from July to September--prime monarch season for me here in Nebraska. If you're ever in Weatherford, OK, check out this undertaker's diorama at the Heartland of America Museum (get it? Die-o-rama?). It's a phenomenal small town museum which is HUGE and VERY detailed. I enjoyed pondering the use of the medical instruments. No. I did not. And I now want a coffin with a window, just like I want an office on campus with one.